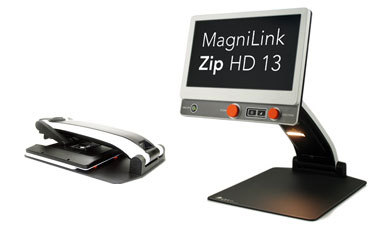 The MagniLink Zip HD 13 (Product # MLZIP-HD-13) desktop video magnifier is at the forefront of modern technology. It was developed to be easy to use, light in weight, and with small dimensions when folded down. LVI products are built in a modular style which means there are many models to choose from to fit the requirements of each user. Uncompromising true-color image quality is ever present and the system is intuitive and user friendly. The control panel was designed according to the highest technology standards and with client feedback in mind. It’s easy to find, learn, and maneuver - for example, the function knobs rotate and are simple to handle, easily seen, and there is an advance mode for advanced users. The 13.3 inch monitor has brightly colored screen edges, an anti-glare surface, provides crystal-clear sharpness, high contrast images, and a dimmer mode for light-sensitive users. The screen is built in hi-definition and is easy to adjust by tilting it forward, backward, and for height. 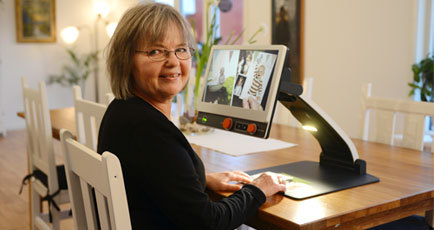 This is the most portable model with a low-vision adapted screen and an HD reading/distance camera that rotates both vertically and horizontally. To ensure easy portability, the X/Y table has been excluded thereby making the video magnifier effortless to fold and unfold and carry to different locations. Its weight is less than 9 pounds and a protective, soft-shelled, zippered carrying case is included. For convenience, a battery with a running time of 5 to 9 hours is included. The amount of run time depends on the light intensity chosen for the screen and lamp. The MagniLink Zip 13 HD is an ideal choice for users who need to transport a magnifying system on a regular basis to school or work. It's also suitable for users that want a sleek system at home - one that can be folded down and put away easily when not in use. We have 2 quick demos of different models of the MagniLink ZIP - one rests on YouTube and the other is below on this page. By clicking on the YouTube link below, you'll be able to view the MagniLink ZIP model with the 17 inch screen option in Full Hi-Definittion and a moveable X/Y table. result in the most amazing picture ever in a video magnifier. easy to manoeuvre – yet it offers an advanced mode for advanced users. surface, crystal-clear sharpness, high contrast and a dimmer for light-sensitive users. quality as all other MagniLink X/Y tables, including friction brakes. user needs, or specifications in tenders. carrying case and distance camera. No other video magnifier is that complete! full control (see page 11). Can I connect the ML Zip to a computer or external monitor? No. 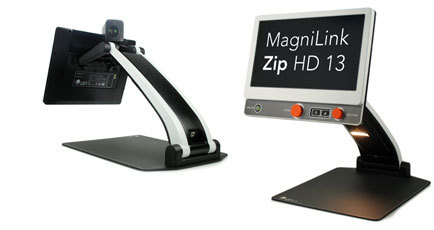 MagniLink Zip is a really great, portable video magnifier, but it is not intended for use with a computer/external monitor as it is meant to be portable. 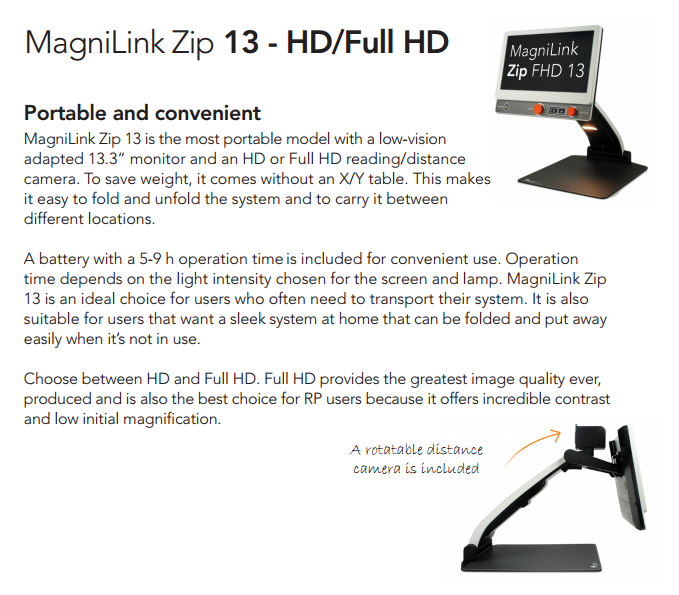 If there is a need for computer connection or additional monitor, we recommend MagniLink Vision or MagniLink S.
The MagniLink Zip FHD 13 (Product # MLZIP-FHD-13) desktop video magnifier is at the forefront of modern technology. It was developed to be easy to use, light in weight, and with small dimensions when folded down. LVI products are built in a modular style which means there are many models to choose from in order to fit the requirements of each user. This model is equipped with a Full Hi-Definition monitor and reading / distance camera. The 13.3 inch monitor has brightly colored screen edges, an anti-glare surface, provides crystal-clear sharpness, high contrast images, and a dimmer mode for light-sensitive users. The screen can be adjusted by tilting it forward, backward, and for height and produces images in Full Hi-Definition (1080p). This is the most portable model with a low-vision adapted screen and an Full Hi-Definition reading/distance camera that rotates both vertically and horizontally. To ensure easy portability, the X/Y table has been excluded thereby making the video magnifier effortless to carry to different locations, as well as easy to fold and unfold. Its weight is less than 9 pounds and a protective, soft-shelled, zippered carrying case is included. 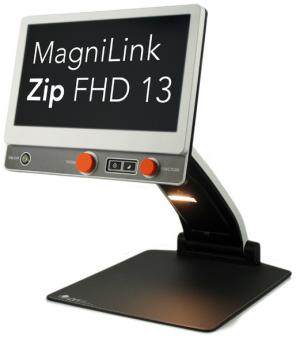 The MagniLink Zip 13 Full HD is an ideal choice for users who need to transport a magnifying system on a regular basis to school or work. 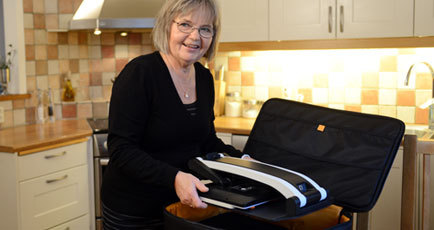 It's also suitable for users that want a sleek system at home - one that can be folded down and put away easily when not in use.